Dr. Brian Goldman is one of those rare individuals with success in more than one high pressure field. He is a well-respected emergency physician at Sinai Health System. For the past 12 years, he has hosted the White Coat, Black Art, a hugely-successful show on CBC Radio One about the patient experience in modern medical culture. He is a doctor who thinks like a patient. 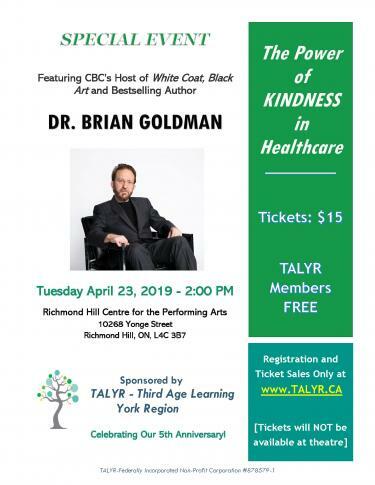 Dr. Goldman is the author of three bestselling Canadian books. His latest – The Power of Kindness: Why Empathy is Essential in Everyday Life – is his most successful book yet. Modern medicine can cure more diseases and extend life better than ever before. But stress, time pressure, and overspecialization have made the experience for a patient or family member less kind than it could or should be. As a veteran ER physician, Dr. Brian Goldman knows all about that. He understands the reasons why health professionals do not always act as kindly as they are born to be. He probes the latest science on empathy and kindness and brings the best advice on how to increase kindness in hospitals, beginning with himself. Purchase tickets at www.talyr.ca starting February 18, 2019 at 9:00 am. Tickets are only available on-line. Tickets cannot be purchased at the theatre.